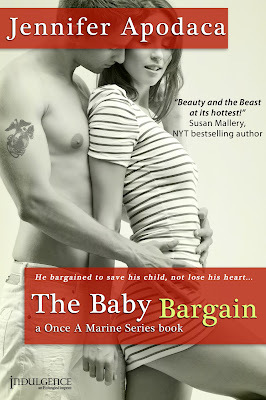 The Baby Bargain is an awesome romance of a determined mother who will do whatever it takes to do right by her child. According to Jennifer Apodaca, even if doing whatever it takes involves Megan Young, a successful young veterinarian, telling her son's ex-Marine, and absolutely against commitment, father that he has a son, well then...she'll do it. This Once A Marine novel may be set in the small town of Raven's Cove, but it's packed with a variety of characters and touching experiences. Apodaca makes it so easy to feel involved in both Adam and Megan's lives, their choices and consequences of their actions. The hint of suspense that threads through the plot enhances the emotional aspect and draws us further into their story. I can't imagine someone reading The Baby Bargain and just completely hating it. It has a mildly heated romance and a relatable theme. With its cozy feel, I recommend it for a rainy summer day when you can just curl up inside and take your time reading it. It's an absorbing read that will definitely take you away!